Samsung Galaxy A9 aims to be ultimate phone for the Instagram generation | What Hi-Fi? 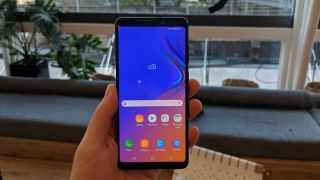 It wouldn't be a phone launch without a headline-grabbing feature, and despite the new Samsung Galaxy A9 sitting in the middle of Samsung's formidable phone range - "premium midrange" is the preferred description – it still gets an eye-catching new spec. The Galaxy A9 has the world's first rear quad camera, with four lenses on hand to help you get the very best pictures (before editing them within an inch of their life on Instagram). Despite being "optimised for the Instagram generation", there are plenty of other noteworthy features, which may have you wondering whether you need to spend £1000 on a phone. The Galaxy A9, which is due on sale in November, will cost a comparatively affordable £549. The Galaxy A9 features a gorilla glass design and has a large, 6.3in Full HD Super AMOLED screen. This is the same display technology as seen on the Galaxy S9 and Galaxy Note 9, though those flagship phones deliver a higher resolution. The A9 settles for a 2220 x 1080 resolution display. In terms of AV performance, there's no mention of hi-res audio but there is support for FLAC and WAV files. And there's a headphone jack as well as a USB-C connection. The Galaxy A9 has a large 3800 mAh battery, which is bigger than those aforementioned flagships, so we should be looking at a phone with an impressive battery life. As for those four cameras, there's the main 24-megapixel camera, an Ultra Wide lens (8MP) that gives you a larger field of view, a Telephoto lens (10MP) that gives you 2x optical zoom, and a Depth lens (5MP), which, together with Samsung’s Live Focus, allows you to adjust the bokeh of your photos (the quality of that blurry background when you're focused on a foreground detail). Inside, the Galaxy A9 offers 128GB storage, with room for up to 512GB of extra space with the addition of a microSD card, plus 6GB RAM. The Samsung Bixby voice assistant is here, plus Samsung Pay and Samsung Health. Could this be all you need in a smartphone? If so, you could save yourself a pretty penny compared to the flagship 2018 phones on offer. The Samsung Galaxy A9 is set for release in November and comes in three colours, caviar black, bubblegum pink and blue lemonade, and will cost £549.